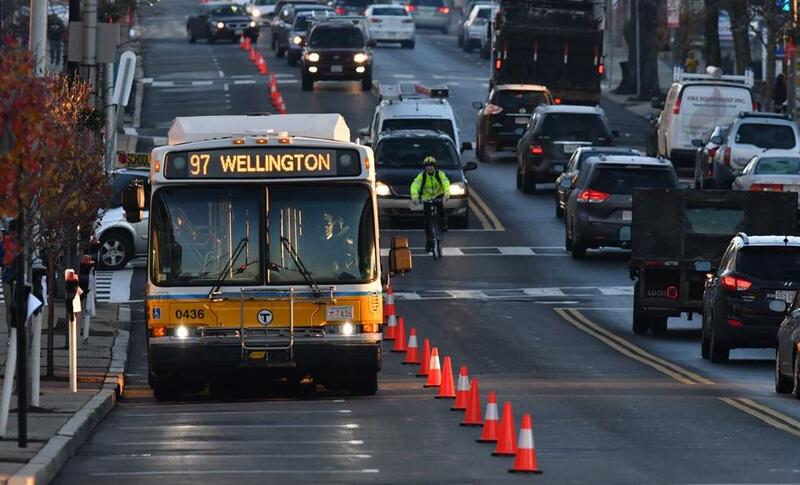 The Baker administration has already pushed the concept of reserving space on city streets for dedicated bus lanes. Above: A bus uses such a lane in Everett. No more gas-powered cars. Frequent commuter rail trains, running all day. Maybe even hefty fees on drivers who insist on driving into downtown Boston and adding to the already fearsome traffic. This could be the futuristic vision of getting around Massachusetts in just a few decades, as recommended Friday by a commission assembled by Governor Charlie Baker to tackle some of the most vexing transportation challenges, including ever-growing congestion, pollution, and decrepit infrastructure. At the heart of the mammoth report’s many recommendations, said Transportation Secretary Stephanie Pollack, is fixing public transit and putting it on sound financial footing, with the explicit goal of reducing the number of cars on the road. “Whether today or in the future, we simply must move more people in fewer vehicles if we are serious about reducing congestion and greenhouse gas pollution,” Pollack said. So maybe it’s no surprise the gas guzzler comes in for a bit of a drubbing. 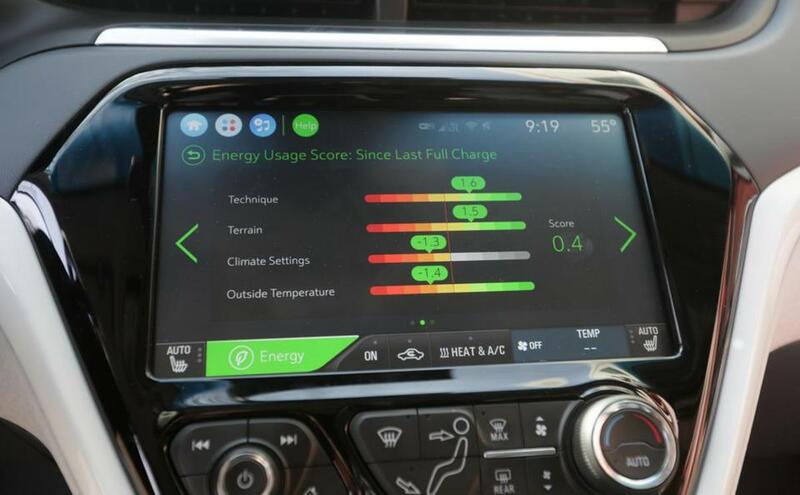 Massachusetts should develop tools to phase out the use of gas-powered cars and light trucks after 2040, the commission said, by offering rebates and other incentives to steer people to electric vehicles, for example. While internationally, France, the United Kingdom, and others are moving toward such policies, in the United States only California has come close to even broaching such an aggressive idea. From cars to heavy trucks, the transportation sector is the biggest source of pollution in Massachusetts. While electric vehicles are only a small percentage of the cars on the road today, major automakers are spending billions to advance their development and that of self-driving cars, which are largely battery-driven. Having a state policy would help speed their adoption. The commission recommended additional nudges in the form of the state government replacing its own large fleet of vehicles with battery-powered cars and trucks as soon as 2030, and building out a much bigger network of electric-charging stations. And regardless of the fuel source, the commission suggested Massachusetts consider so-called congestion pricing, or levying fees or tolls of a kind on traffic heading into the city at busy periods in order to discourage driving. Electric cars make up only a small percentage of vehicles on the road today, but that would change. New York has struggled with adopting a congestion-pricing plan for the traffic-clogged streets of Manhattan, and earlier this year in Massachusetts Baker vetoed a legislative proposal that would have tested a version using toll discounts outside rush hour. On Friday, he budged slightly, saying he’s “willing to hear” about congestion pricing, but was clearly still skeptical. He could only support it, he said, if drivers have other options for transportation. And he questioned whether it would be fair to lower-income drivers, especially since he believed the charge would have to be very high in order to be effective. The characteristically careful response from Baker had some advocates questioning whether this transportation report will follow the fate of other recommendations from so many policy commissions and gather dust in a forgotten corner of the State House. It would be hard for Baker to completely divorce himself from the commission’s work; the group was chaired by his former chief of staff, Steve Kadish, and Pollack was also involved. For his part, the governor generally endorsed the broad ideas behind the commission’s report, but said implementing the many recommendations would take some work. Many recommendations march on familiar ground for the Baker administration, by codifying existing policy priorities such as rethinking the entire commuter rail service to boost ridership, for example, and reserving space on city streets for dedicated bus lanes as a way to speed up high-capacity vehicles. The report also calls for investments to prepare infrastructure for extreme weather and improving rural transportation, and also for officials to consider the effects of driverless cars and other technological changes when they develop new policies. For the most part the report does not specify how to achieve most of the goals. Kadish said that was intentional, so that leaders could adapt to changing circumstances. And as for paying for all this, the firmest the commission would go was to urge public officials to commit to long-term financing for the entire transportation system. Baker has often argued the mass transit system, for example, does not need new revenues. But on Friday he indicated support for one potential source: partnering with other states to cap pollution from transportation sources, and auctioning off allowances to fuel distributors, with proceeds invested back in the system. That idea was also listed as a recommendation, and Baker on Friday said he has held “really positive” discussions with other governors about it.